1. A pair of binoculars for zooming in on birds or other elusive wildlife. A magnifying glass for closeups of insects and plant life. 2. A Field Guide of insects and birds of North America. There are many excellent ones you can borrow from a local library or download onto your Kindle or iphone. 3. A journal or notebook will help you record sights, sounds, names of animals and plants you discover, and details to use in writing a story or drawing a picture when you get back home. 5. Comfortable shoes, water, snacks. Try an outing at different times of day. What is awake in the early morning hours may be totally different from what is active mid day or at sunset. If you’re having difficulty finding “critters”, be still and listen to the sounds of nature. This stillness often leads to amazing discoveries. It will definitely bring you peace and calm your stress. If you’re near water, turn over some rocks at the water’s edge. There are many hatching insects under them to marvel at. And, like every good naturalist, remember to leave only footprints, and take only pictures and memories, and bring back any trash left behind by the human animal, so we can enjoy the natural world for years to come. Don’t Throw Away Orphan Toys. Do This Instead. http://www.stuffedanimalsforemergencies.org delivers gently used toys to children in need. Go on the website to check for your local community chapter. http://www.Babybuggy.org takes kids and baby gear along with maternity and children’s clothing that is in good condition. They distribute it to needy families. For books contact: www.donationtown.org to schedule a pick up along with others in your area. Just enter your zip code and choose from local charities you’d like to sponsor. Another way to re-purpose books is at: www.booksforafrica.org You pay for shipping to the Atlanta warehouse, but it is tax-deductible. Spring awakens fruits and vegetables from their slumber, providing us with local produce that’s crisp, colorful and bursting with flavor. Locally grown asparagus, sweet peas, scallions and rhubarb are the seasonal treats I most anticipate when visiting farmers markets or pick-your-own farms. Fresh radishes, strawberries or spinach is a treat, but it’s also fun to incorporate them in your cooking. I especially like to prepare a quiche for spring brunch or lunch that incorporates asparagus, green onions and mushrooms. Recipes for spring quiche abound. Basically, you prepare a pie crust, or — my personal favorite — buy it frozen. Then find a basic recipe online that incorporates a mild grated cheese, eggs and milk or cream. Chop a cup or more of spring vegetables and saute for about five minutes. Sprinkle about 1/2 cup of a mild shredded cheese on the bottom crust of a 9-inch pie shell, add the vegetables, pour the egg mixture over it and sprinkle another 1/2 cup of cheese on top. Bake in oven at 375 degrees for 20 to 25 minutes until the mixture sets. Let it rest for five minutes, slice and enjoy warm. A simple salad and crostini or soup fill out your meal. About the time rhubarb is ripe, I start thinking about a pudding my great aunt from Denmark fed me when I was a child. This recipe comes close to the flavor and texture I remember. The Danish name for it is Rabarbergrod. Clean and cut 1 pound of rhubarb into small pieces and cook together with 2 1/2 cups of water 7 to 10 minutes or until tender. Add 2/3 cup granulated sugar when almost done cooking. Stir in 1 tablespoon of cornstarch mixed first with a little cold water. Heat and stir until thickened and clear. Stir a few times while cooling. Makes 4 cups. Add a few drops of red food color for a brighter color. Serve chilled. Please consider leaving a comment about your favorite spring fruit or vegetable and how you prepare it. Marilyn Ostermiller is a long-time business journalist who now writes for children. You can follow her on Twitter @Marilyn_Suzanne. 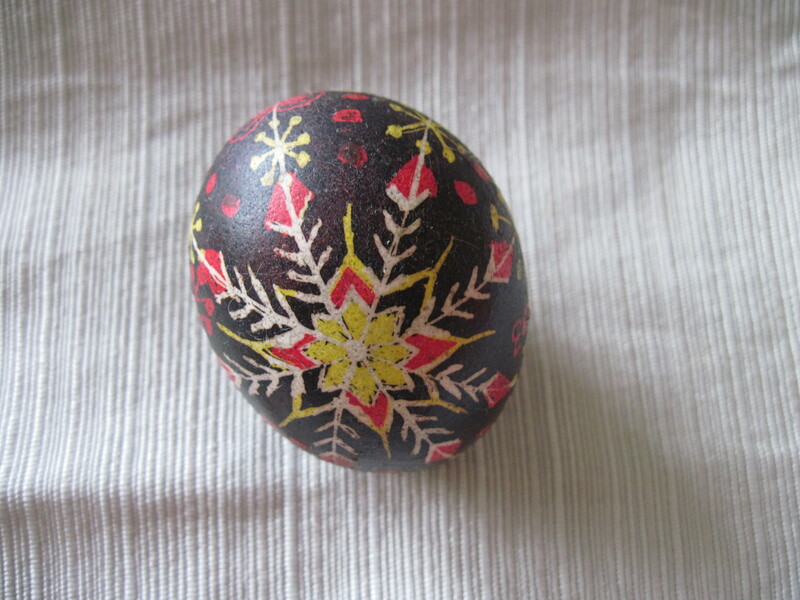 I decorated this egg at a workshop on how to do PISANKY. Happy Easter and Happy crafting! Heal The Earth Classroom Contest. After the long winter, kids in your classroom may long to get outside and play or explore. Why not make it part of the curriculum? Perfect for Earth Day or Arbor Day, here’s a contest your classroom can participate in to show ways we can help heal the earth. The contest is open to classroom teachers and librarians. 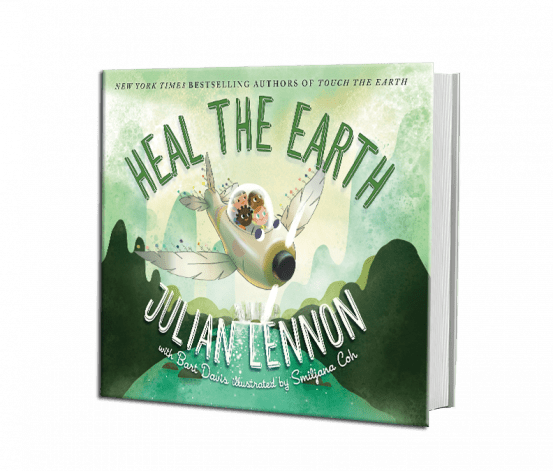 Winners will receive a signed copy of Author Julian Lennon’s new book HEAL THE EARTH. All submissions must be received by midnight EST on Monday, April 30. Fun Facts on Flying Squirrels by Shiela Fuller. Most of us are familiar with the gray squirrel that is found in parks and backyards but did you know there is a squirrel, also found in parks and backyards, that flies? They do not fly with wings as birds do but glide through the air with a web of skin connecting their wrist to their ankle, called apatagium. This excess web of skin is easily observed in this photo. Flying squirrels like to eat nuts, seeds, insects, bird eggs, flower buds, mushrooms and fungi. Usually the flying squirrel nests in cavities in old trees but occasionally will build a leaf nest called a drey, like the gray squirrel, or use a nest box. Build a flying squirrel nest box for shelter and place it on tree in your own neck of the woods and try to attract them with food, and a source of water. In this picture, the nature walk guide opened up the nest box. In winter, many flying squirrels of varying ages will occupy one cavity or nest box to maintain warm body temperatures during the cold. When supplying nest boxes, it is important to put up more than one box, so the squirrels can chose among them. Once you know your boxes have squirrel families residing in them, give them their space, as you would any wild animal, otherwise the squirrels may relocate. Flying squirrels are nocturnal and because of this they have extra-long whiskers, better for touching things in the dark, keen eyesight, and very sharp hearing. Because they are nocturnal, the flying squirrel is a preferred food for nocturnal predators like eastern screech owls, great horned owls, martens, foxes and coyotes. Of course, squirrels also fall prey to snakes, hawks, and domestic cats. The best way to see flying squirrels is on a guided night hike in an area where they are known to live. Reach out to your local state park for more information on night hikes and ask about the kinds of animals seen. Each February at the Eagle Festival in Mauricetown, NJ, a guided walk is taken along the Glades Wildlife Refuge. If you’re lucky, you might just see a flying squirrel. Shiela Fuller has been a Cornell University Project Feeder Watch participant for many years and an avid birder since 1988. Currently, she enjoys writing picture books, yoga, chicken raising, wildlife photography, and is the legacy keeper for her family. Would you like to see more rainbows? You must be in the right place at the right time. It’s not just a matter of luck when we look into the sky on a rainy day and spot a glorious arc. The sun has to be shining behind you and rain or mist or spray must be in front of you. That’s when you are in the perfect spot to enjoy one. Rainbows occur when sunlight and rain combine in a very specific way. When a beam of sunlight travels toward Earth, the light is white. But, if the light beam happens to hit raindrops at a certain angle on the way down, the different colors that make up the beam separate so that we can see them as a rainbow. The angle for each color of a rainbow is different, because the colors slow down at different speeds when they enter the raindrop. The light exits the raindrop in one color, depending on the angle it came in, so we see only one color coming from each raindrop. Light at different angles coming through many raindrops form the rainbow that we see. April, with its famous showers, is a good time to be on the alert for rainbows. But if Mother Nature doesn’t provide one when you are in the mood, you can create a miniature one for yourself with a garden hose. Meteorologist Joe Rao suggests you simply stand with your back to the sun and adjust the hose to a fine spray. Rainbows can also be seen against the spray of a waterfall. Rainbows are the subject of several children’s picture books including nonfiction books that explain the science behind the beauty and fictional story books. — Ready-to-Read Level One Rainbow. Newbery Honor recipient and New York Times bestselling author Marion Dane Bauer teaches beginning readers about rainbows in this one. It is illustrated by John Wallace. — A Rainbow of My Own, by Don Freeman. A small boy imagines what it would be like to have his own rainbow to play with.